8th April 2017, at P3 bar ishieke ABAKALIKI. It was gathered that he graduated from the department of history and international relations Class 2016. Theo as he was fondly called was said to be coming back from a birthday party, and decided to branch at the bar where he was shot dead. Another guy was also reported shot on the same bar last month but he survived it. 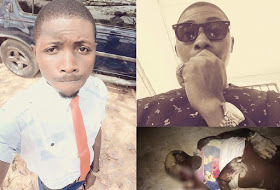 0 Response to "Fresh Graduate Of Ebonyi State University Shot Dead By Suspected Cultists(Photo)"